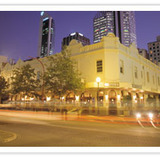 Although described as a cafe, this Pub is one of the most unique and fascinating pubs in Perth CBD. The decor replicates a 1930's style Belgian beer hall. They have a wide range of imported Belgian beers available, with various beers on offer on each day of the week. Special offers include Monk Mondays, with Trappist being just $10 a glass. Tripel Tuesdays with $10 Tripels, White Wednesdays with $10 Hoegardens. Stella, sang and song with $20 Stella and a burger offers and live music from 4pm on a Thursday. $10 beer specials every Friday. $8 chips and Stella on a Saturday and real 1L Stein jugs served every Sunday. So there's something for everyone at the BBC, every day of the week. The food is great, with various food offers on top of the drink offers. I would particularly recommend the Mussels, they're delicious. The location is ideal for city dwellers, workers and tourists, lying on the corner of Kings and Murray Street in Perth CBD. The staff are friendly and good fun, shouting 'Sante' and ringing bells across the cafe whenever they are tipped. The atmosphere is relaxed and informal, while the outdoor seating is perfect for a drink in the sun. There are various live music events at the BBC, these may be subject to change throughout the year. A current favourite is 'Swing and Soul Sundays', where patrons are offered free entry, a free 30 minute swing dance lesson from 'Swing It Dance Company' and exclusive food and drink specials from 6pm.